TORONTO -- Ontario's former Progressive Conservative leader is defending the nearly $300,000 he spent on support staff and office operations after resigning from the party helm earlier this year, saying it was in line with legislative rules and involved severance payments to staff. 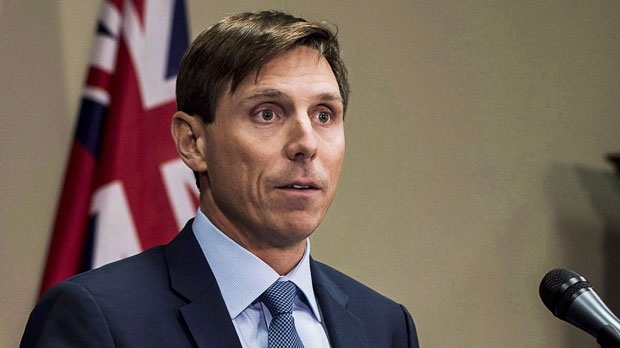 A government document leaked Thursday shows Patrick Brown, who is running for mayor in Monday's municipal election in Brampton, Ont., carried out the spending in his final two months as a legislator, when he sat as an independent following his removal from Tory caucus. The spending report captures expenses from outgoing legislators in the 2018-2019 fiscal year. It shows Brown -- who didn't seek re-election -- spent $206,956 on support staff salaries, $53,271 on office operations and $16,426 on communications from April 1 to June 7, when the provincial vote was held. Brown, who resigned as Progressive Conservative leader amid sexual misconduct allegations he denies, said the spending involved severance payments that were all above board. "All my staff were legally and morally entitled to severance in my transition from Leader of the Official Opposition to MPP to stepping down at the last general election," he said in a statement. "They were paid by the Ontario Legislature in accordance with the policy regarding severance for staff of departing MPPs and Cabinet Ministers." Brown's spending in those areas is far higher than other legislators listed in the document. Former legislator Lorenzo Berardinetti spent the next highest amount on support staff with $84,376, and former legislator Sarah Campbell spent the next highest amount on office operations at $15,179. Brown did not respond to questions about how many employees were part of his staff, but the spending report shows he had 10 people on the payroll during that time period. According to the document, Brown hired two new staffers within days of his resignation as Tory leader, bringing his staff complement up to five. At the start of the new fiscal year in April, an additional five staff members were hired, the documents show. Brown did not respond to questions about the timing of the hires. Tory legislator Randy Hillier, a former caucus colleague who has been critical of Brown since his resignation as party leader, called on provincial police to probe the matter. "I think there needs to be a full, thorough and complete investigation by the OPP on Mr. Brown's time in elected office," he said. "There's 300,000 reasons why, to start with." Hillier said most legislators have two to three office staff and try to spend their office and staff budgets carefully over the course of a fiscal year. "He spent it all in that short period of time knowing that he was not running for office again," he said. "We looked at the average expenditure for people who didn't return ... they were about less than $80,000." Premier Doug Ford's office did not respond to a request for comment. The Opposition NDP called on Brown to explain his spending. "Mr. Brown needs to come clean," NDP legislator Taras Natyshak said in a statement. Earlier this year, Ontario's Integrity Commissioner J. David Wake said Brown breached the Member's Integrity Act four times over matters involving his personal finances, but there was insufficient evidence to find him in breach over alleged travel violations. In a 60-page ruling, Wake said the public had a right to know Brown accepted a loan from a man who would become a candidate for his party. That investigation was triggered by a complaint in February from Hillier. Wake said Brown admitted he failed to disclose rental income of approximately $20,000 on his personal residence in 2016 and 2017 and failed to disclose a $375,000 loan from Jas Johal, a former Tory candidate in Brampton, in 2016 and 2017.